We fished hard for some King Salmon when the season first opened. Then it quickly shut down due to the fact that there are NO FISH. It felt better not catching anything after a great year last year. At least the dogs had a great time at the beach. As real Alaska residents we are allowed to put a net into the water and scoop out fish. We previously did this for Hooligan. Now it was time to do it for salmon. ADF&G: This popular fishery takes place from late June through July in the marine waters of Cook Inlet just off the mouth of the Kenai River. Since 2003, Alaskans harvest between 130,000 and 540,000 sockeye salmon annually in this fishery. The Kenai River is a large glacial system draining the central Kenai Peninsula. The river begins at Kenai Lake near the community of Cooper Landing and flows approximately 82 miles down to its mouth in Upper Cook Inlet, near the community of Kenai. The City of Kenai is approximately 160 highway miles south of Anchorage. We loaded onto the boat on this rainy day and stuck our nets in the water. We held the nets in the water until feeling a thrashing fish. Then you quickly lift the net out of the water and into the boat. Your crew pounces on the fish (or multiple fish if you are lucky) and swiftly kills and bleeds them. Occasionally, you get a monster! When you get home, the real work begins. The (borrowed) smoker was hard at work. The (new) freezer is full now! Having successfully caught a King Salmon on the fly, I wanted to show me friends why it is so exciting. We headed back down to Anchor River and fished until nearly midnight. Hardly needed headlamps. Unsuccessful on day one, it did not matter with a “sunset” like this. The next day, the river was closed to fishing so we got to explore Homer and the Homer Spit. Homer is in the news lately because of the fight on immigration that it is battling. The next day, the river was back open and we hit it early. We spent a few cold, almost dark, hours practicing our casts, and hooking and losing a couple of fish. Then it turned on. We found the right spot and the right time and we crushed it. The freezer is starting to fill. Fly Fishing for King Salmon. After the madness of Memorial Day, we headed south to the Anchor River to see if we could catch a King Salmon on a fly. The patriotism of the bald eagles were in full swing. The night before we fished, we got to spend some time by a campfire doing the usual things. It seemed like a good omen. The next day, we had a hook up! Hanapa’a. The eagles were vigilantly watching to see what would happen. We did it! We landed one. That gave us plenty of time to explore the beaches in the area. What a beautiful spot! Fishing Ship Creek for King Salmon. There is a beautiful spot near downtown Anchorage called Ship Creek. Okay, so it isn’t always beautiful. It is muddy. A slippery and sticky mud that claims many boots and the occasional life. It is near the train depot. It is loud and crowded. It is always littered with fishing line, bags of salmon eggs used as bait, and junk food wrappers. I just can’t seem to stop going here. The tides need to be timed correctly. Apparently. At low tide, the creek flows rapidly and the fish stay out at seas. Apparently. At high tide the place looks like a lake and it is hard to cast to where the fish allegedly are. While there are people catching fish there, I have not been one of them. I even gave up my morals of fly fishing and resorted to flipping out spoons. I have acquired and lost many lures already this season. I still haven’t fished with bait, or tried to floss them, yet. The season is coming to a close. This is the closest place to our house where I have a chance of catching a King Salmon. It is easy for me to strap my rod to my motorcycle, wear my boots and waders, and be fishing in 20 minutes. At least the spot has beauty in its own way. Who cares that people are occasionally murdered there. Fly Fishing at Beach Lake. With a day off, we wanted to fish with our friends. We loaded up 4 people, 3 dogs, 2 float tubes, and 1 canoe. We arrived at Beach Lake to see fish rising, no wind, and mostly cloudy skies. Fly selection began on shore. The mosquitoes were not terrible, but very present. We saw some tiny grey bugs flitting around, but I had left my Colorado style size 20 and smaller box at home. Should have brought it. I used a black gnat fly that worked best all day. It was smashed on the surface, but even more productive while being slowly stripped just under the surface. The views were incredible, like they always are here in Alaska. Looking down, I saw fish in the net, or rising all around us. Looking up, we saw terns, eagles, loons, amazing mountains, and float planes. It never seems to get old. The wind picked up and fish stopped rising. We traded tips and tricks while not thinking about how quickly the weather can change and shut down a good day of fishing. After a while, the wind died down and the hot fishing resumed. The only thing better than having stinky hands and cold feet was the burger at the local pool hall after all of it. 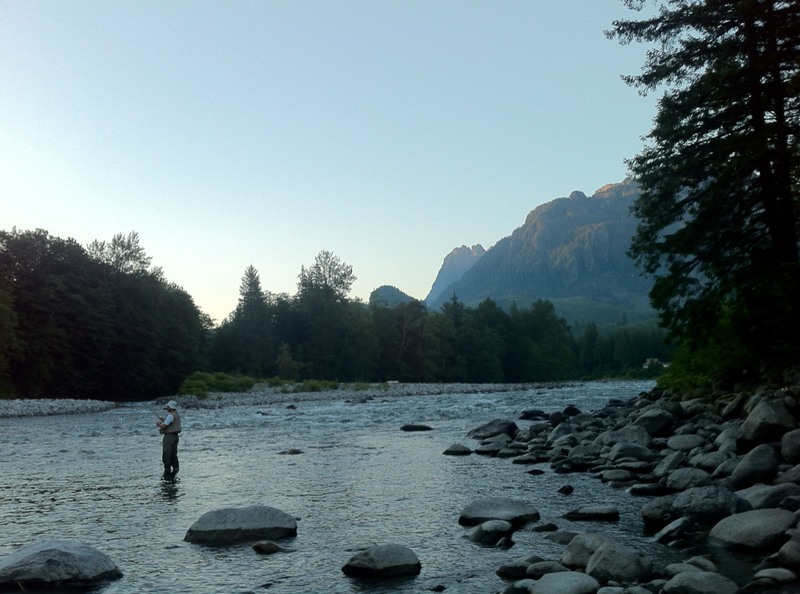 Another Day Fishing the Skykomish. When Derek calls to tell you that he will be at your house at 4 AM it is hard not to be angry. Then you think that you might, you just might, finally catch a steelhead. The weather is terrible for fishing, hot and sunny. 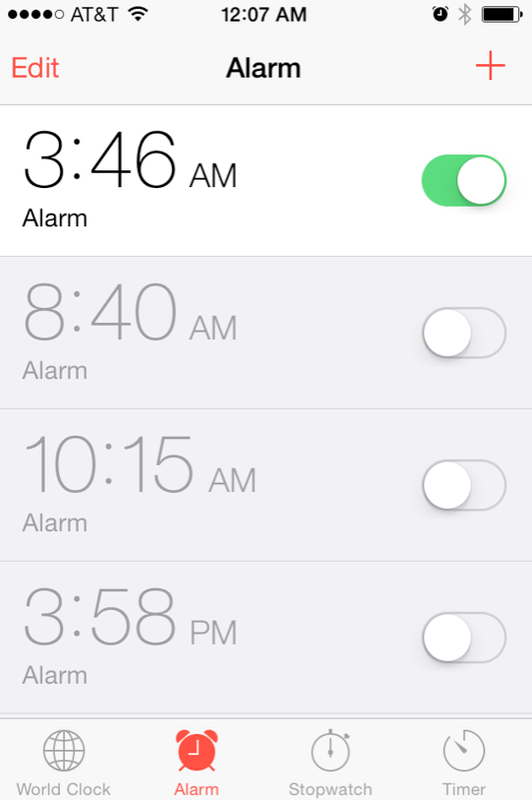 But you set your alarm and do it anyway. Leland taught me the importance of naps, but I was glad to wake up and take a picture of Derek as the sun was rising over our first spot. Even when the fishing is slow, it is nice to see the absolute beauty of the outdoors. As the sun climbed higher, the naps were initially more enjoyable, but at a certain point in the day it becomes uncomfortable to nap in waders. The water was low and as the clocked ticked onward, I began losing hope in my chance for my first steelhead. Derek pulled in a few non steelhead fish. He was not as impressed as I was. 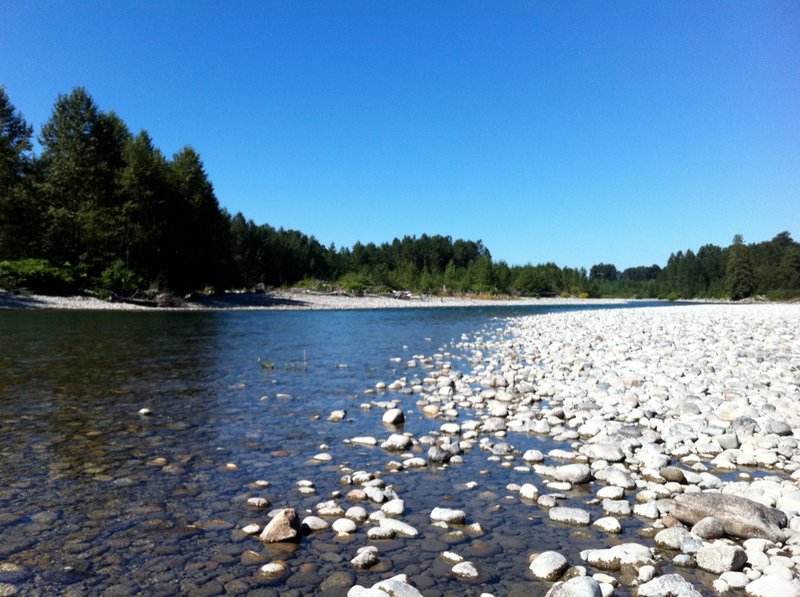 I have thought that the Skykomish is as barren as it gets. On the way back to the car, I got the biggest surprise of the day. I brought in a king salmon. What?! Out of nowhere we landed this little guy. Thanks for a great day Derek! We are now ready to get that steelhead!